dry matter intake and how we manage it. What do you feed? Email your labels from any supplements you’re currently feeding prior to the workshop, and on the day, bring in hay samples or licks that you are feeding. Desiree Jackson (Desiree Jackson Livestock Management) and Col Paton (EcoRich grazing) are the presenters at this event. This event is being held at “Croxdale”, via Charleville. To get there, travel 12km along the Quilpie Road (Diamantina Development Road) from Charleville and turn left at Croxdale sign (after the big rock). RSVP to admin@sqnrm.com.au or phone 07 4656 8500 by 11 December. 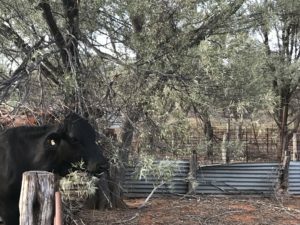 This workshop is supported by GrazingFutures, an initiative of the Queensland Government’s Drought and Climate Adaption Program (DCAP) that aims to improve drought preparedness and resilience for Queensland producers.